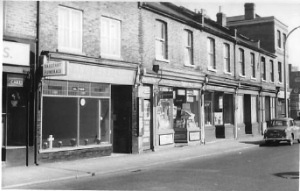 Diane Lockie has provided these photos of a short parade of shops taken by her father around 1966. Part of no. 240 through to no. 246. No. 241 (with crosses in window) was 'Sargeants Funerals', run by Frederick Sargeant. This view was taken from a little further along and shows part of 242 and along to 246. No. 243 was Lambert, boot repairer. The four shops, 242-245 were all owned by A H Farrow at the time of the 1909/10 Valuation, each had a central recessed door with windows on either side. Beyond no. 246 lay New Spring Gardens. Demolition of the old properties beyond New Spring Gardens had started before WW1 and the second photo shows a glimpse of new buildings in the distance. This view shows the same parade viewed from beyond no. 246 looking westwards. 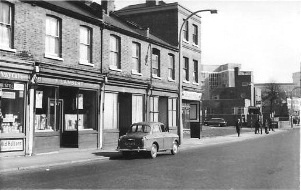 The waste ground was originally the site of numbers 247 onwards: number 247 survived as a beerhouse (Duke of Cambridge) until at least 1911 and as a shop until 1928. The 1940 trade directory shows numbers 248 and 249 still in use, but no reference is made to 247, 250-253. 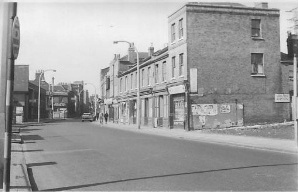 The site has two older views of no. 245, one taken around 1900 and the other in 1936.